Sad face indeed. I’m not crying, it’s been raining on my face. At least they have rearranged the dates so hopefully we can still go, although it seems that the dates and days don’t match up which is very confusing. 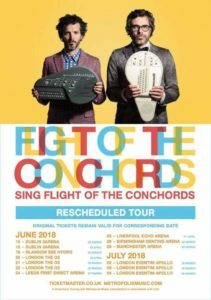 We also had Peter Kay tickets but that tour was cancelled (for very good reasons of course)- now we are just waiting to find out if anything else we have tickets for gets cancelled as these things are meant to come in threes. 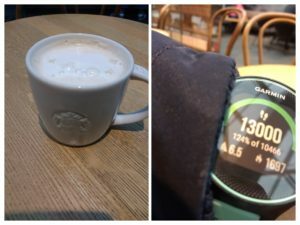 The other Saturday I walked into town in the afternoon and got my free drink (Vitality is keeping us in Starbucks at the moment- you get a free drink and a free cinema ticket each week)- I was pleased to have exactly 13000 steps at that point. It’s like when you fill up with petrol and manage to get exactly to the pound- little things make me happy! 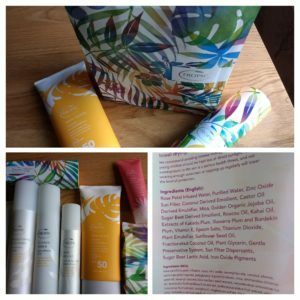 My Tropic stuff arrived! Each produce comes with a little sleeve with the ingredients listed in English as well as Latin, which means you have actually heard of most things. 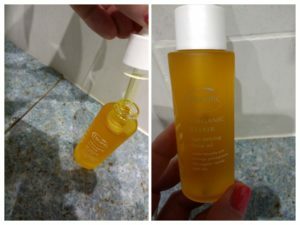 I bought the starter kit with cleanser, toner, moisturiser and a scrub, some sun cream and then my favourite, this little bottle of Elixir (age defying facial oil)- it smells amazing, like marzipan, and contains lots of good sounding things such as rosehip oil, kiwi seed oil and plum kernel oil (which I think is where the marzipan scent comes from). It has a little dropper and you mix a drop into your normal face cream and especially after a long run in the cold (the combination of cold air and salt on my skin makes it very sore after long winter runs) it makes my skin feels loads better. One happy customer so far. Plus the dropper is fun to use and reminds me of my science lessons at secondary school. We’ve had some very impressive skies recently. I was out on a run one evening after work and I was heading towards blue skies and a few clouds. I turned a corner to start heading home and these black clouds greeted me. 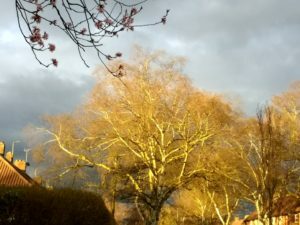 I think with the sun on the trees it looked even more dramatic. Yoga has still been going well. A few weeks ago we had a lovely session on the day of the spring equinox (it was also a full moon, or maybe a new moon, something to do with the moon anyway). We finished the session with some candle meditation (basically we sit in a circle in the dark, wrapped in a blanket, and look at a candle, and then close our eyes and picture the candle, and once you can’t see it any more, you open your eyes to look at it again)- I sometimes struggle with waking in the night and I have found that picturing the candle in the middle of the night is one of the things that helps me get back to sleep, so it was good to have a refresher of this. Towards the end of term I was feeling pretty shattered and I nearly didn’t go to the final yoga session, feeling like I didn’t have the strength for holding a downward dog for any length of time, but of course I came away feeling much better for it. 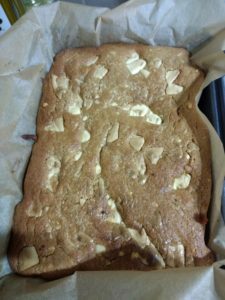 I’ve also been doing a spot of baking recently- these were requested by someone at work (peanut butter blondies). I had not made them for ages and had forgotten how good they are. 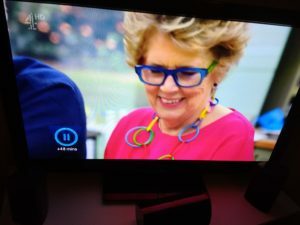 Also, I was watching the celebrity bake off the other day and had to freeze the image because of the necklace that was being worn. We have these little construction toys at school called clever sticks (basically little circles and lines of plastic that clip together)- the children will often make the members of staff lovely necklaces using them- I feel this had happened on this occasion too! Do you like it when your petrol (or other things) end up on round numbers? Do you like going to see shows? I love seeing live bands, orchestras and also comedy gigs. Races got cancelled here because of the snow. They seem to come in a rush, cancellations, don’t they? The blondie looks yummy and good to hear about the skincare stuff too. The blondie looks amazing. I thought blondies were just white chocolate version of brownies but apparently not according to GBBO! Me too- I just thought they were made with white chocolate instead of dark chocolate! I saw that though- something to do with brown sugar as well?